The cold may be common, but its cure remains elusive. Autumn Holmes aims to change that. Holmes, a graduate student in the UCI School of Medicine’s Department of Microbiology & Molecular Genetics, believes an enzyme may hold answers. Holmes’ doctoral thesis focuses on deciphering how a host cell enzyme, tyrosyl-DNA phosphodiesterase 2 (TDP2), functions with viruses that cause the common cold, as well as related viruses. She also wants to know whether TDP2 inhibitors can be modified to treat people for whom colds caused by human rhinovirus may have more serious effects, such as asthmatics or patients with chronic obstructive pulmonary disease. The idea is that turning off the protein may cause changes in the host cell that would inhibit virus replication without selecting for mutations that might make the virus resistant to the inhibitor. Holmes has seen the concept work in a mouse cell model. Now, she is exploring whether it translates to human cells. She works in the lab of principal investigator Bert Semler, PhD, professor of Microbiology & Molecular Genetics and director of the UCI Center for Virus Research. This novel research was a factor in Holmes being named the first Dr. Lorna Carlin Scholar in late 2017. The award, intended to recognize the importance of supporting the next generation of scientific leaders, is given to an exceptional doctoral student who is conducting a translational research study. Holmes’ investigation is based upon an earlier finding of novel TDP2 activity by Semler’s lab. Semler, who is Holmes’ thesis advisor, says her studies could add to the body of knowledge on RNA virus-host interactions. One day, it may even contribute to the development of targeted anti-viral drugs to combat diseases caused by the large family of picornaviruses involved in the common cold, myocarditis, aseptic meningitis and hepatitis, among others. “I am confident that Autumn’s excellent research acumen will continue to lead to novel and important findings,” Semler says. Holmes began preparing for this opportunity long before she entered a lab. As a child, she spent summers with her grandmother, a teacher with a love of learning and an extensive library. One day, while scanning titles, Holmes came across one that was especially intriguing. It turns out that Holmes shared her grandmother’s passion for learning — and teaching. As a University of Michigan undergraduate, she volunteered in a local elementary school classroom, providing supplementary school sessions for children whose primary language was Spanish. While doing post-baccalaureate studies at the University of Rochester, she tutored colleagues in cell biology and virology coursework. There, she also connected with an undergraduate student. Since starting her doctoral work at UCI in 2013, Holmes has introduced hundreds of elementary and high school students to the excitement of science. Her current initiative is Reach Out Teach Out at UCI, a community outreach program she co-founded to bring local high school juniors to campus to hear graduate students present their scientific research and work hands-on in the lab. 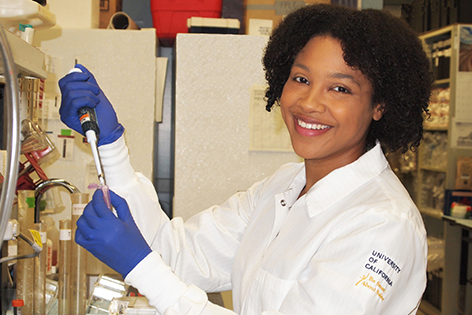 As many of Holmes’ undergraduate peers launch careers and begin to pay off student loans, she is juggling a full schedule of scientific research and presentations, mentoring, peer training, and a host of other activities. It’s a path she anticipates will lead to directing her own lab as a research professor, and new opportunities to fight infectious disease. Holmes has chosen a long and, at times, financially unpredictable path, but one that fulfills her competing passions for research and teaching. She expects to complete her doctoral degree in biomedical sciences — a six-year journey — in June 2019. If she is like many who pursue professorships at research universities, a postdoctoral fellowship will follow. The funding she receives as a recipient of the Carlin Award is a welcome incentive to stay the course.